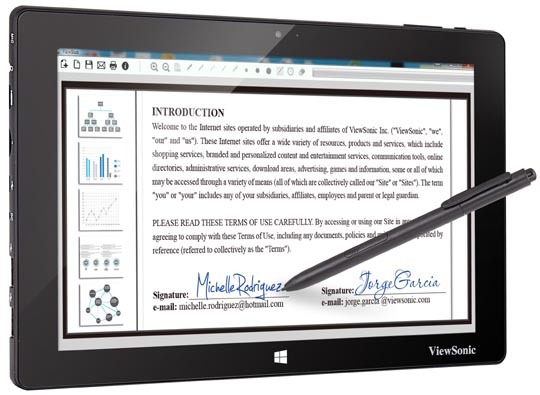 ViewSonic Corp. introduces its Windows®-based 10-inch PT1080 Pen Tablet, making it the best breakthrough of hardware innovations for businesses. 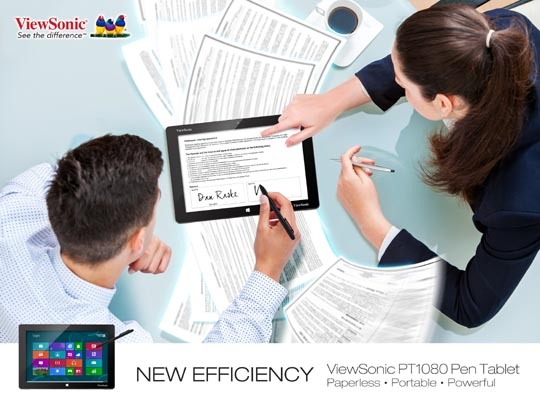 With the integration of palm rejection, Electromagnetic Resonance Pen technology (EMP), and a 10-point touch panel, ViewSonic’s PT1080 strengthens its usage by being fully upgradeable to Windows 10 OS ensures smarter data management and an invaluable e-signature experience for business customers. Moving away from traditional service counter, the PT1080 empowers representatives to leave the counter and enable personalized communication solutions. Building upon its award-winning display heritage, ViewSonic’s 10-inch PT1080 Pen Tablet has proven its position for improving smart data management, mobility and accessibility functions, and customer satisfaction in the business industry. “The PT1080 Pen Tablet is designed to improve corporate efficiency by providing better data management for businesses. 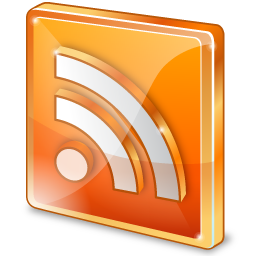 Businesses are now obliged to create more innovative approaches to either better manage their intelligence system or improve client services through day-to-day contact. The service approach has changed from before, from traditional counter lineups to quick self-service or deluxe personal service for VIPs. 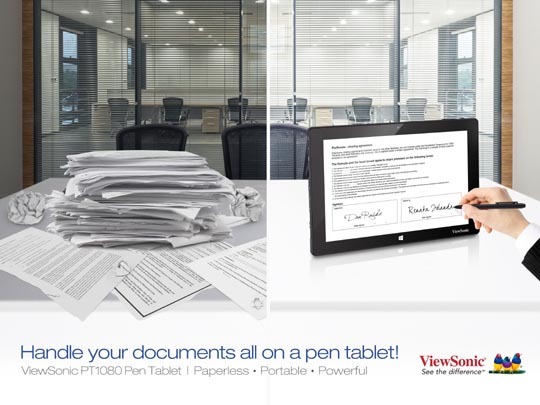 The PT1080 Pen Tablet serves to provide an easy, mobile, and secured service with paperless and digitalized signature solutions. In the insurance industry, the PT1080 offers convenient methods for clients to be able to quickly check contract agreement content, encryptions, and sign with the V Pen. This product can also be applied in the hotel industry for offering convenient and easy e-signature service for VIP customers who check-in or check-out. The PT1080 accommodates to both industries and also safeguards everything you put inside your pen tablet,” said Bonny Cheng, General Manager of the Display Business Unit at ViewSonic. 10-inch Windows 8.1 OS Pen Tablet, powered by the proven Intel Baytrail-T (Quad-core) 1.33Ghz processor, is designed to improve data management for businesses. Professionals can experience the simple use of collecting, storing, and accessing data right on the Pen Tablet with its 2GB of DDR3L memory and 32GB of storage. In addition, with 10-point touch-enabled PT1080 Pen Tablet enables friendly web-browsing, typing, or applications execution. Professionals can conveniently manage data on-the-go with easy connectivity to USB, Micro USB, Mini HDMI, and Micro SDfor more applicable purposes. The 10” Electromagnetic Resonance Pen Tablet features 1280 x 800 resolution ensures a pleasant viewing experience for customers to enjoy. 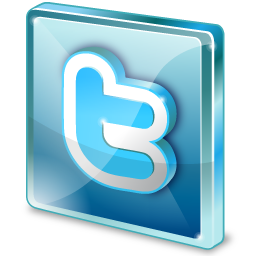 The SuperClear® IPS panel technology provides a consistent and true-to-life image. With an 8H hardness surface for anti-scratch and durable use, PT1080 represents the first a line of Pen Tablet for businesses from ViewSonic.